P3: EVM Totalizer to prevent Voter Victimization? It’s memory lasts for ten years (even without constant electricity supply). It’s chip as date-time stamping facility to find out when exactly the keys were pressed. Auxiliary display unit (ADU): to view the data, if the original display panel of Control Unit gets damaged. means 16 x 4 =64 candidates. if >64 candidates then paper ballot system has to be used. If one unit malfunctions, no need to re-start polling again. You can join a spare EVM & resume public from the queue. Programming code is “Burnt” into the microprocessor chip (P-ROM). This fused program cannot be overwritten, altered or copied. It has no networking connectivity, so hacking via LAN/wifi is impossible. [American EVM can be controled through network & remote control.]. EVM randomization: noone knows the serial number of EVMs in advance, before they’re shipped to the booth. Yes, same EVM can be used simultaneously for two elections! EVM can record maximum five votes per minute. So the Goonda-gang will need 30 minutes to put 150 votes, but within that time, Police party will come. Booth officials can press “Close” button on control unit, then EVM will not accept any data. Goonda-gang cannot register any bogus votes. If circuit/memory re-wired, unit will stop functioning. If more than 64 candidates, then paper-ballot has to be used. Can record maximum 3840 votes. Can record only 5 votes per minute. Even if battery malfunctions, memory storage won’t be affected. name and symbol of the candidate for whom the vote has been cast. paper slip will remain visible to the voter for seven seconds, through a glass-covered window. Then it’ll automatically fall in a sealed box. Later EC can use these slips for crosschecking / physical verification of votes during recounting. Some parties allege that EVM machines can be manipulated. 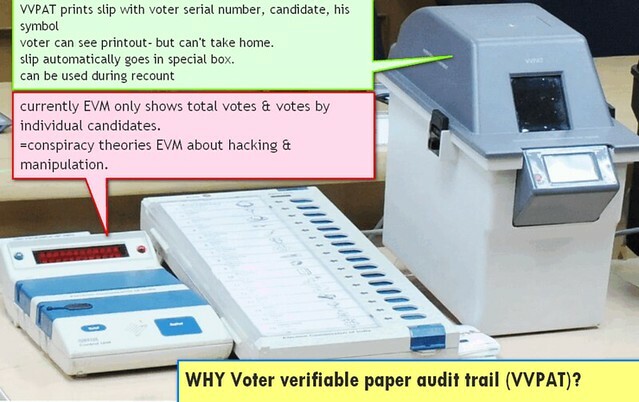 VVPAT is developed to clear an air over authenticity of the EVMs (Electronic Voting Machine). Helps physical verification /crosschecking votes. Will help to resolve the election disputes. 2013: SC ordered EC to introduce VVPAT in phased manner in 2014 general election. When EVM did not have “NOTA” option, and If voter wanted to exercise NOTA, he had to fill this form. This form would contain his name and signature= voter confidentiality compromised. Form 20, is the final result sheet. It shows polling station-wise results. This will also compromise voter confidentiality. How does Form-20 compromise Voter confidentiality? Form 20 is given to the polling agents of candidates. 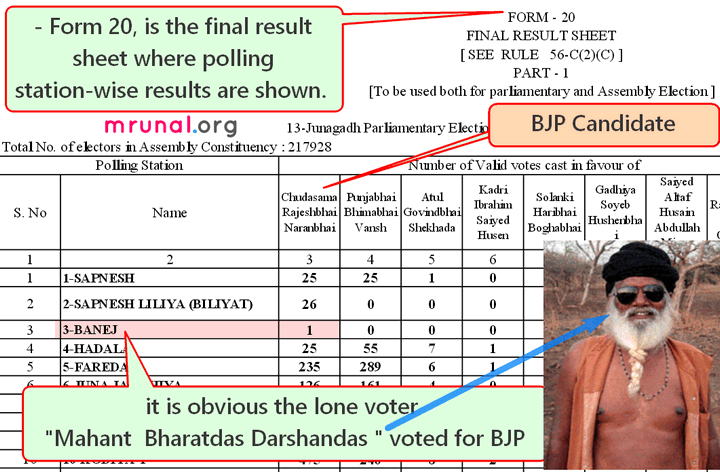 Banej polling booth, Gir forest (Junagadh constituency)= only single voter Mahant Bharatdas Darshandas. It is obvious Mahant voted for BJP. Form 20 has exposed his secret vote. Now, Congressi-karyakartaa may vandalize Mahant’s house, property and may even break his expensive sun-glasses to take revenge. In other words, if a single person votes in EVM then his secrecy will be compromised because of form-20. In the same photo, observe that Sr.No.2 Biliyat village didn’t give a single vote to Congressi candidate Punjabhai Bhimabhai Vansh. So, it is possible to find out which polling station/village/hamlet was in favor of which candidate. Then politicians/ goons / feudal lords might harass the villagers accordingly. in short, Form20 + EVM=> post electoral voter victimization possible. In paper-ballot system, this was difficult. Because during counting, the officials will randomly mix the ballot papers to conceal the voting preference of individual polling stations. But how can EVM Totalizer help? EVM Totalizer can count votes of multiple Electronic Voting Machines (EVMs) simultaneously. EVM Totalizer’s prototype ready. EC even tested it in UP bypoll (2009). EVM totalizer is connected to EVMs via cable. Can do sum of all votes from 14 EVM simultaneously. 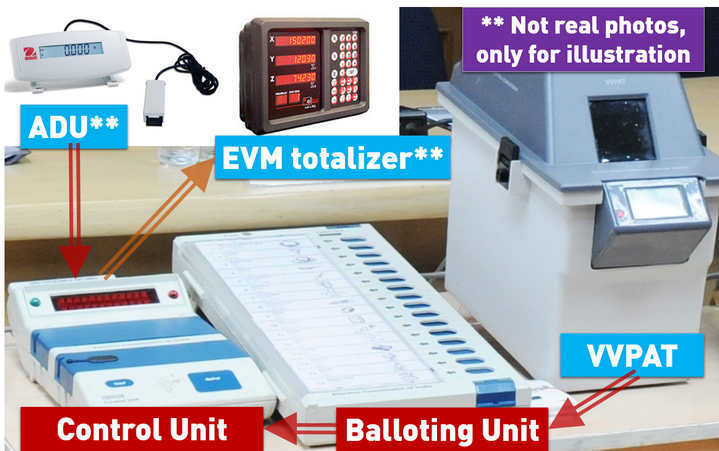 Why EVM Totalizer not implemented? but “Conduct of Elections Rules, 1961” designed as per Representation of People Act (RPA) 1951”. Therefore, to adopt nationwide EVM totalizer system, we need to amend RPA Act. 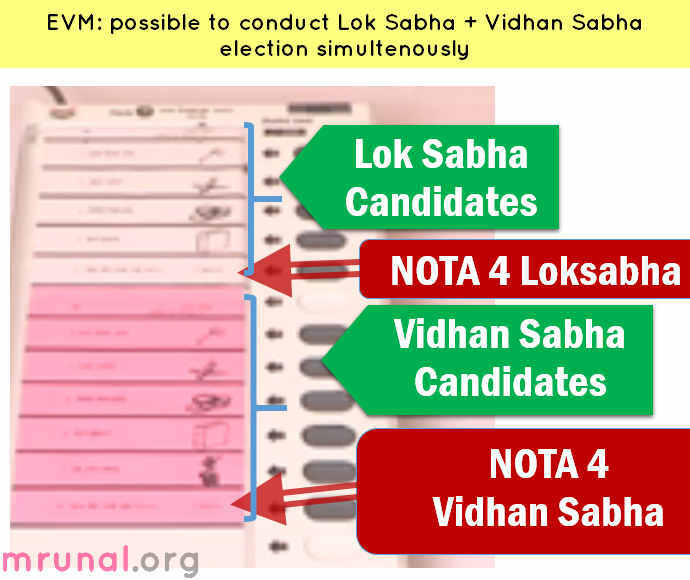 To discourage booth capturing, the EVMs are designed in such way that one EVM can record only 1 vote per two minutes. When you press blue button, your vote is stored at two places- one in the balloting unit and second backup in the control unit. EVM control unit needs constant electricity supply from a built in battery otherwise its memory will be wiped out. Q2. Which of the following is/are incorrect methods of assembling an EVM? Q3. Which of the following are essential components of an EVM, without which process of voting and counting is impossible? In emergency, EVMs can be run on the lead-battery used in sarkaari-jeeps. EVMs can record a maximum of 6400 votes. Single Balloting unit can cater to a maximum of 64 candidates. Q5. What is the use of form 20 in the elections? To file nomination, the candidate has to fillup his income, assets, criminal cases etc. as per the format given in this form. EC will show polling station wise result according to this form. Q6. Following are imaginary headlines in a newspaper. Which one of them will get the CEC nervous? A Banglore techie-blogger claims he can overwrite the code in EVM circuit via wifi to make it record 6000 votes in a minute. Sadhu Yadav asked 70 of his goons to file nominations along with him in the same Constituency. IB report says he also has plans for booth capturing. Sadhu Yadav has hired the techie mentioned in option A, and is planning for booth “hacking” through OB van of a media channel. Only 1 and 3- balloting unit and control unit without them voting impossible. Even if other instruments are absent, still you can conduct elections and count votes. B- more than 64 candidates = paper balloting. And booth capturing is easier in paper ballot system compared to EVM, hence it should give highest stress to CEC. Option A and C are junk because EVM cannot be hacked via wifi to record more than 3840 votes irrespective of what Banglore techie brags. Mains: What is EVM totalizer? How can it prevent the post-electoral voter victimization? 200 words. Interview: First VVPAT and now the columnists are demanding EVM totalizer. Can’t we simply do addition via EXCEL spreadsheet? What’s the need of one more stupid machine? I am searching for some practice papers for CSAT but not able to find proper reviews. Can you please provide pointer to some good practice paper sets available for CSAT apart from TMH GS Manual(which is way too much for a practice book). “congressi karyakarta may even break his expensive sunglasses” dat was hilarious!! Thanks Mrunal bhai for writing articles in such informal and interesting way!! This is the first time i have smiled since morning amidst such hectic study schedule! Way to go brother! Sir I did not get…what do u mean by just 4 evm can be attached..attached to what..and if its with cu,,then paper ballot usage.???? And at the end u r writing 3840 can max vote.plz clear it..
Say when ..total candidates are 65 what will b done.. The Paramilitary forces (PMF) ensure the internal security of the country. Most of these forces generally perform counter-insurgency or anti-terrorist missions. All branches of the PMF function under purview of the Ministry of Home Affairs (External website that opens in a new window). Indian Paramilitary forces have several components with different roles. Overall it has a two tier structure, the Central Police Organizations (CPO), which forms the first tier, and the second tier known as Central Paramilitary Forces (CPF). Mrunal sir there is some technical problem in opening Environment articles, kindly help…. TOMORROW …AMARAN ANSHAN AT MUKHEJEE NAGAR NEW DELHI….AGAINST CSAT!!!!!!! PLZZ FOLLOW US….TIME 1 PM. amran ansan ki jagah thoda padh lo to pass ho jaoge.. I hav made a mistake while applying for RBI grade B officers exam. Instead of selecting GM category I hav selectd OBC. Kindly tell me how to rectify dis? to whom I ha to approach? pub ad 1, pub ad 2: 96, 65.
i want to correct my mistake for next attempt but i am unable to identify reason of my failure.sir please advice me if i am lacking in knowldge or writing style. pls help. Sir,plss give tips how to tackle language papers essay writing and is there any effort require as i read somewhere daily writing practice should beneficial. dear sir, pls tell me is there any difference in marking system for hindi and english medium for mains. i m comfortable in both language pls tell me which language should i choose..
Dear Mrunal sir, thanks a tonne for your growing contributions. the above article is highly informative. only one suggestion from my side, “Braille” is not a language, it is a tactile writing method or system produced and used for the persons with blindness or visual challenges. with the help of Braille, we can write in all the languages. Don’t worry bro if u lossed 60% by 1 less %,i am too below 60% in my pg coz i did part time work +study so proffessor cut my marks in practical n i have more marks in theory than practical…let it b ..remember this “itihas aapka is bat se aakaln nahi karta k ap jite ya hare ,ye dekhta hai apne war kaha saha chati par pith par.